Whether you're a childcare provider, a parent, or a teacher, here's a host of activities that are fun, inexpensive, and easy to do at home or in the classroom. These activities are great for kids between the ages of three and seven. They are designed to build school readiness skills, with special emphasis on early and emergent literacy. 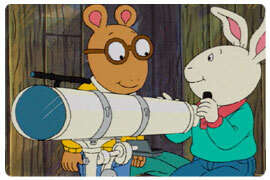 While each is related to a theme in a specific ARTHUR episode, all of these activities can be used independently. For more fun and learning away from the computer, check out the many cool features in the Print area of the main ARTHUR Web site.